← Artist’s Talk: John F. Simon Jr.
Last night, The Phillips Collection took home the Excellence in Artistic Discipline at the 28th Annual Mayor’s Arts Awards. 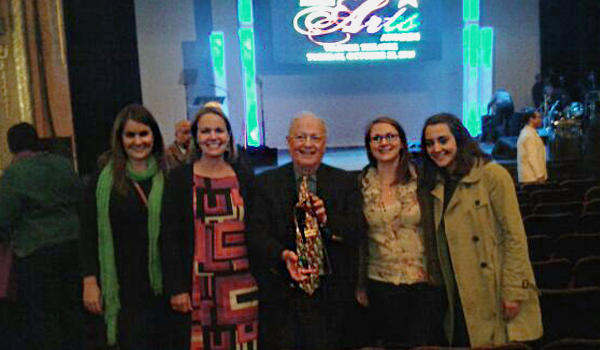 A number of staff headed to the Warner Theater to root for the Phillips and Trustee Tom Mansbach (pictured above at center) accepted the award. Thank you to the DC Commission on the Arts and Humanities for holding this annual spotlight to the arts, all of the partners who help us think creatively, and everyone who cheered on the museum last night! Your support is appreciated. Congratulations to all nominees and winners! We are proud to be counted among so many wonderful arts organizations. Check the Art(202) blog for a full list. This entry was posted in Experiment Station and tagged DC arts, DCCAH, Mayors Arts Awards. Bookmark the permalink.